Browse this Woolworths Catalogue 13 - 19 Feb sale for the grocery, meat, seafood, fresh fruits, snacks and more. As usual, they have many offers of half prices, great discounts like low price always and more. You should see cereals and pantry products on pg 14-15 as well. Low Price always deals on Greek yogurt of Woolworths, frozen fruit and Woolworths muesli. With Easiyo you can make your own yogurt. Find yogurt maker and yogurt sachet with discounts on pg 15. Woolies has a low price range of Chili haloumi, Greek or Danish style, Cherry bocconcini, goats cheese, mozzarella cheese on pg 16. Dairy products including cheese blocks, freshly filled pasta, school night dinners, dare iced coffee and more can be seen on pg 18-19. Get Connoisseur ice cream cookies with a $3 discount. Pay only $7 for the product. 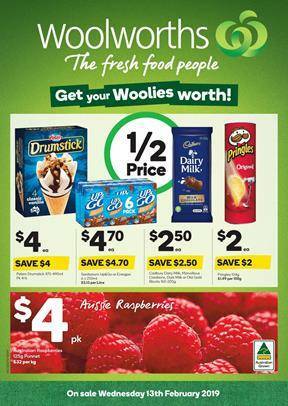 Woolworths Catalogues are always full of similar deals on weekly products like these. Check out fresh fruits including strawberries, Aussie peaches, raspberries etc. Navel orange is $4.50/kg this week. Browse the meat and seafood category for t bone steak, imported small cooked Vannamei prawns. Many more products are on sale and available in the catalogue. Deli-bakery section has half-price and low price deals, too. Go to pg 26&27 for details. Valentine's Day cupcakes will be a limited sale and cost only $8!